How to hide early pregnancy from your friends and colleagues, peers and so on? While it’s totally up to you when you tell everyone the news – and who you tell – lots of people wait until after the first scan at 10-13 weeks or until they are out of the first trimester, for reassurance. It’s what we did, both times, which meant there was around two months of keeping it a secret. Which is really hard when you’re as terrible as keeping secrets as I am and it’s one of the biggest, most life-changing secrets EVER! 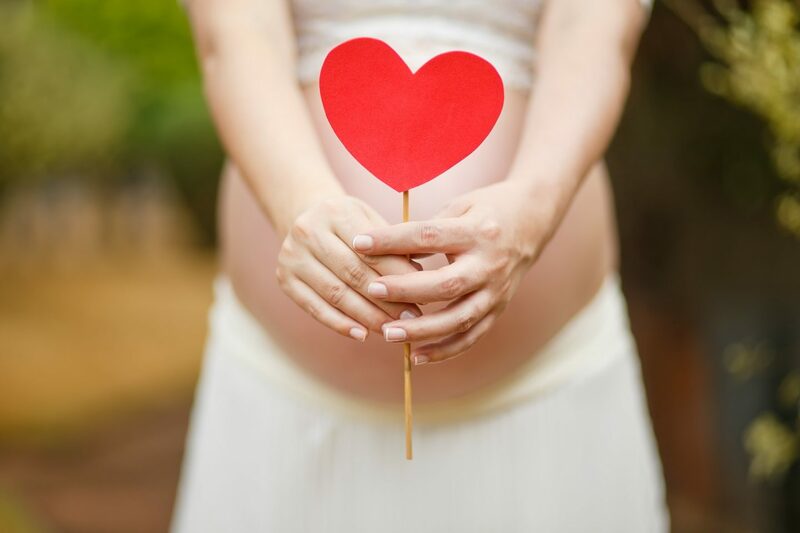 There are many reasons you might not want all of those around you to find out that you are pregnant, not least because you want to keep it to yourself for a little while. Over the weeks we did tell a few strategic people but left the big reveal till after the scan. Go with what you’re comfortable with. People are likely to guess and make their own assumptions anyway. But if you want to avoid awkward questions and deflect attention it’s good to have a handy cover story. So here are some suggestions on how to hide your early pregnancy from friends and colleagues. This is bearing in mind you don’t suddenly pop out your bump really early on, which would be a massive giveaway. In which case; lots of layers. 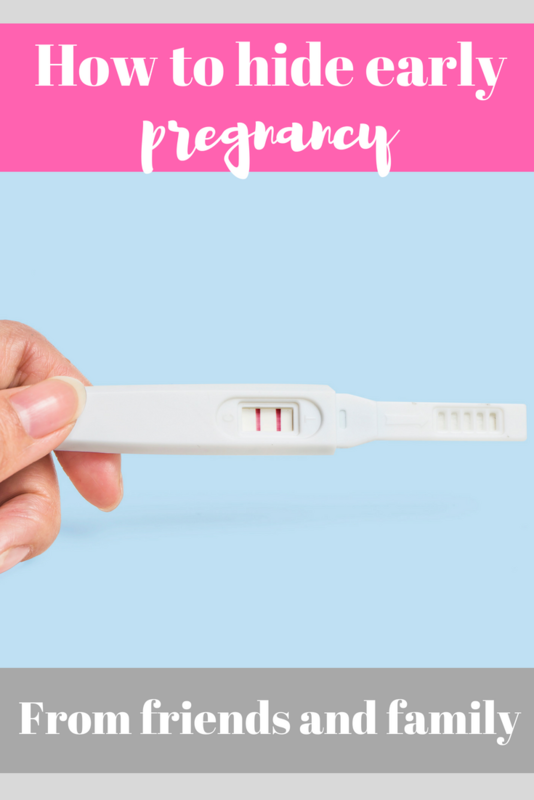 If you think you might be pregnant but aren’t too sure, here’s a list of early pregnancy symptoms…and here’s the low-down on the what to expect from the first trimester. How they will guess: The biggest clue will be changes to socialising – especially if you go out drinking a lot or start refusing all those tasty cheeseboards at dinner or go home at 9pm when you’re usually the one having ‘just one more’ with a brie / camembert chaser and dancing on the tabletops at closing time. 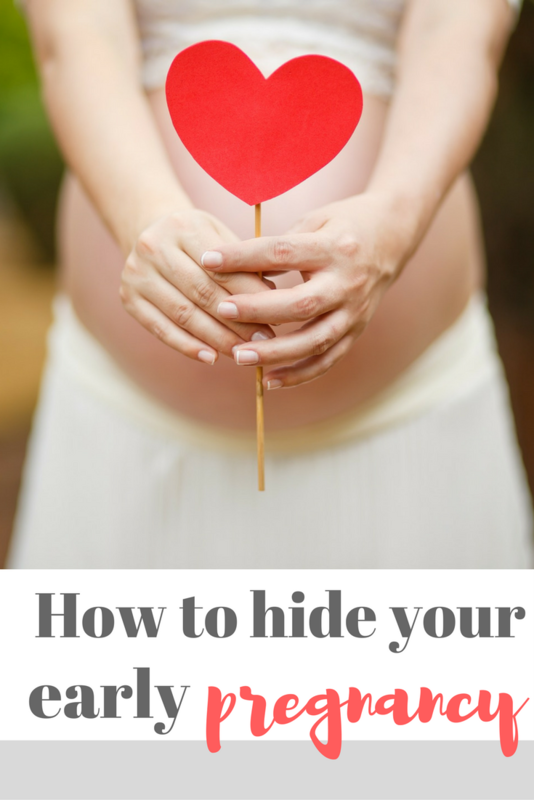 How to hide early pregnancy: I wrote a post on how to keep your early pregnancy a secret which covers lots of these including the one thing NOT to say. But the best ones seem to be – pretending to be too hungover for hair of the dog even, or more long term – pretending you are on some sort of diet (e.g. pro-fertility one where you don’t drink). Or just be very busy and mysterious all the time. How they might find out: Lots of time off work for appointments, missing drinks and socialising, looking really rough in the morning and rushing off to the bathroom a lot. How to hide your early pregnancy: I worked full-time in a small team in a big office where no-one ever had time off sick and it was always very noticeable if people had time off. And in early pregnancy, I had to have a lot of time off (for midwife appointments but also because I was high risk so had to see consultants and various clinics). I think what everyone assumed was that I was going for another job and having time off for the interviews…which I did nothing to convince them of otherwise. If you work in a young office then everyone’s usually hungover so using that as an excuse for not drinking usually works. Don’t refuse drinks or this will sound the ‘pregnant’ siren – take one and hold it, or swap it for a clear drink in a spirits glass. Cheers. How they might find out: If it’s not your first pregnancy, it’s likely that you will be surrounded by other parents and doing lots of parenty things – school runs, baby groups, playgroups, playdates and so on. If you’re refusing your usual ten cups of tea or double shot coffee, not having a sneaky wine, not making it to the early morning baby groups because you feel so rough in the morning then they might suspect. How to hide your early pregnancy: Say it took too long to leave the house to be anywhere early, which is probably the truth anyway. But as parents themselves who’ve also kept early pregnancy secrets, they will recognise the early signs a lot easier. Here’s where you can probably swear people to secrecy earlier.